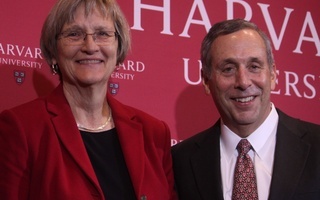 On Sunday afternoon, the presidential search committee announced that Harvard Corporation member Lawrence S. Bacow will replace University President Drew G. Faust to become Harvard’s 29th president. We are quite optimistic about their pick. 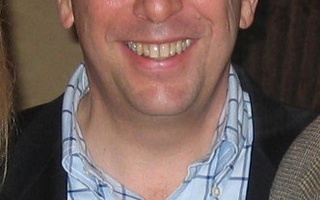 Bacow has spent most of his life in higher education as an academic, administrator, and leader. His experience as president of Tufts University, given the largely positive reviews he received there, affords him an unprecedented level of qualification as compared to any University president in recent memory. In light of this, we find reason to agree with the faculty who have commended the search committee for choosing him. However, on a more profound level, the committee’s pick of Bacow serves as a window into the priorities of the search committee. He will take office at a time when Harvard faces strong political, cultural, and financial headwinds. His selection reflects the aims of the Corporation, which comprised a majority of the searchers. The emphasis of the selection—in resume, reputation, and rollout—has been the perception that Bacow is most qualified to face the threat that the current political climate poses to the status of higher education within our society. 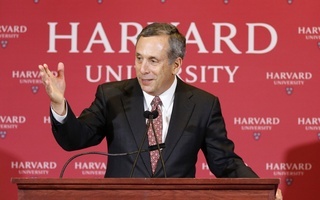 This, of course, does not mean that we or the searchers aim to discount other challenges the University faces, including Harvard’s financial situation, an area for which Bacow has sufficient experience. Nevertheless, we are confident in Bacow’s ability to fulfill his role as this advocate for higher education at a time when we need it most, and we approve of the Corporation’s prioritization during this unprecedented time for colleges and universities around the country. Higher education is currently under siege by politicians: As a result of the recent Republican tax overhaul, Harvard’s endowment was set to be taxed, graduate stipends were nearly taxed, and the student loan deduction was nearly eliminated. But there is a reason why these political attacks are resonating with Americans. Many are feeling unprecedented antipathy towards higher education, which is extremely concerning. That being said, we challenge Bacow to recognize that he is inheriting two jobs. While he is indeed becoming the face of higher education in America and around the world, he is also about to take the helm of our University. Since he is currently more familiar with Harvard’s administration than its students, we wish to see him actively try to engage with the latter. Specifically, given Bacow's limited visibility to the College to this point—in comparison to his impressive experience with the University’s graduate schools—we encourage him to closely interact with students at the College and to maintain a focus on their experiences, just as he did at Tufts. And despite calls for a more groundbreaking presidential choice in terms of racial and gender diversity, we do not believe Bacow should be judged individually on his personal identity. 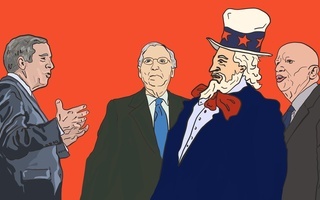 Indeed, his upbringing in a region of America that increasingly feels left behind by economic and educational progress will likely give him insight into how to assuage the mistrust of universities. Finally, while we express here a positive outlook on the Bacow presidency to come, we also feel it incumbent upon us to remind him and our readers that we will scrupulously hold him accountable. We, and Crimson Editorial Boards to come, look forward to commending his successes and constructively critiquing his failures, and will continue to be even-handed yet passionate in our role. What Is the Value of a Harvard Degree? Rather than elevating our tastes and abilities, Harvard has merely reshuffled the deck of future employees—with its graduates closer to the top.